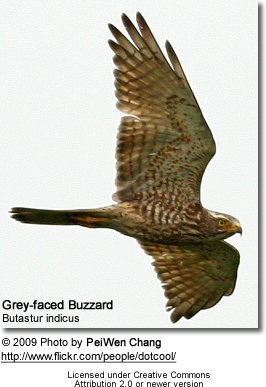 The Grey-faced Buzzard (Butastur indicus) is an Asian bird of prey. The Grey-faced Buzzard is a bird of open lands that breeds in East Russia, North China, Korea, and Japan, and winters in South-east Asia. This medium-sized raptor is typically between 41 and 46 cm long. The adult has a grey head, breast and neck, white throat, black moustaches and mesial stripes, brown back and upperwings, and brown bars on white underparts and underwings. 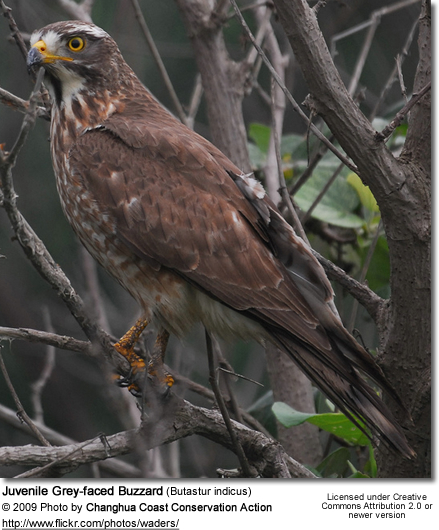 The juvenile is brown and mottled above, pale below with brown streaks, and has a broad white supercilium (line above each eye) and brown face. Its diet consists of lizards, small mammals and large insects.